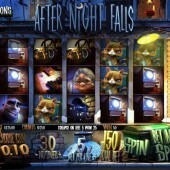 Gorgeous 3D graphics and animation, as we’ve come to expect from slots developers Betsoft Gaming, and a nice brooding noir-ish feel bring the crime-themed slot, After Night Falls, to life. The 5-reel, 30-payline slot sees you as French gumshoe, Detective Rousseau, as you prowl the streets on the hunt for a cunning thief – not so cunning, as it turns out, as the biggest jackpot in this game is a mere $625, and there’s no progressive to be had. However, if it’s atmosphere and animation you want, As Night Falls has it in spades. Inspector Clouseau – sorry, Rousseau – and our burglar friend are animated symbols on the reels, and to fill the spaces we have plenty of related items: security cameras, swag bags, TVs, jewellery, the burglar’s cat and detective’s magnifying glass. This is an animated Betsoft joint, of course, so keep an eye out for stacked symbols – they’ll collapse into a single icon and bag you extra cash prizes to boot. Meanwhile, the Inspector’s desk is the scatter. Get as few as three of those in any position and you’ll be awarded free spins with a multiplier (up to 10x) chosen at random. If free spins are your (swag) bag, look out for the magnifying glass as it acts as the game’s Wild. When used to create a win, the symbol will cunningly move to a different position and the reels will re-spin again and again until the magnifying glass reaches the left-hand reel. 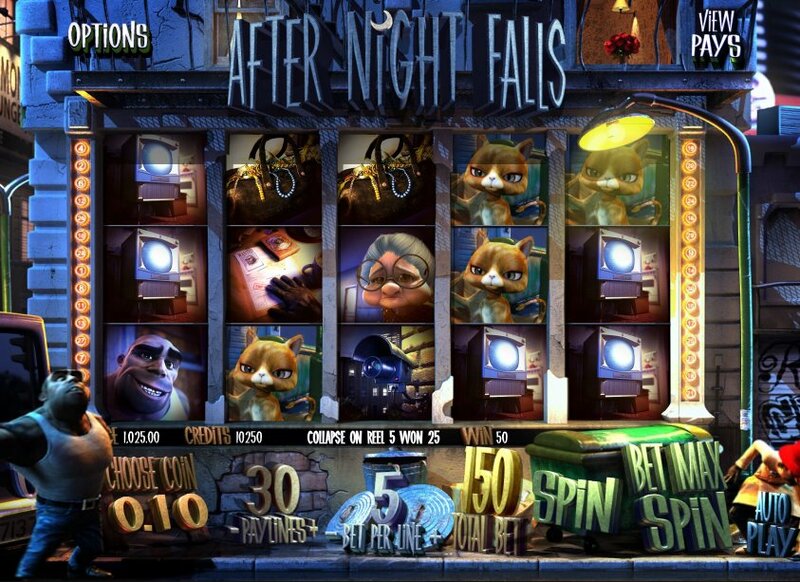 If bags of free spins don’t float your boat, however, the game is saved by its bonus games. Firstly, you get to have the chance of becoming the thief when three or more of his faces appear on the reels. You’ll be whisked off to a game where you simply have to choose houses for him to break into. A successful robbery will win you more cash. Keep busting into houses until the ‘Collect’ sign appears and your total haul is displayed. The next bonus game is triggered by the friendly grandmother appearing on the reels. This time you’ll take the role of our smart detective as he assesses clues to a robbery in her apartment. Find the evidence, bag the cash – simple! Do Betsoft actually make ugly slots? We're not too sure. Some nice bonus games make this worth a look, although the lack of a big jackpot is the game’s main downfall. If you’re an animation fiend, make sure to play Betsoft’s salsa-inspired slot, At the Copa, with its enticing progressive jackpots, and the same developer’s jungle-tinged game Safari Sam will leave you tickled pink too.